Through City Grants we are looking to our community to deliver important projects that will contribute to the cultural and sustainable development of our city’s public places - think arts activities, events, installations and more. We want to give you a platform to excel in your area of expertise and focus your skills and creativity on delivering projects that build on the story and character of the space it will be delivered. With your help, we want to strengthen our community’s connection to the public spaces of Civic, Braddon and Acton. We’re looking for engaging projects that enrich the place experience – experiences that are extraordinary and bring our community back to the city centre again and again. Place-making is a place-led collaborative process to create places that people love and feel connected to. 1.2. Primary Objective – What’s the purpose of this program? To develop and support the vitality of Civic, Braddon and Acton through creative and engaging place-making initiatives that strengthen our community’s connection to Civic, Braddon and Acton’s public spaces and encourage habitual visitation. 1.3. Outcomes – What do we expect you to do? Are committed to sustainable practices (refer to 5.3.). 1.4. I want in! What do I need to do? If this sounds like something that you would like to be a part of, read on. And don’t forget, we’re here to help. The second round will open in August 2019 for activities from 1 January to 30 June 2020. The round will open March 2019 for activities from 1 July 2019 to 30 June 2020. Applications are assessed by the City Renewal Authority. Applications are assessed by an independent panel consisting of representatives from relevant Government agencies and external stakeholders, including at least one levy payer or representative. 12 months (up to 24 months can be requested where required). City Grants is administered by the City Renewal Authority and funded through the City Centre and Marketing Improvement Levy (CCMIL). The City Renewal Authority was established by the ACT Government on 1 July 2017 to lead urban renewal in the City Renewal Precinct (the Precinct). Our Vision - Our precinct will be the vital heart of a dynamic and internationally competitive city, cherished by its people. Our Mission - We will contribute economic growth and diversity to Canberra’s city community by delivering, people-focused, design-led, sustainable and commercially astute projects and programs using sound management processes. Levy Vision - The CCMIL is a partnership between Levy payers, the City Renewal Authority and the ACT Government that supports actions which contribute to the long-tern sustainable growth, economic prosperity, culture, creativity and vibrancy of the Levy Collection Zone. 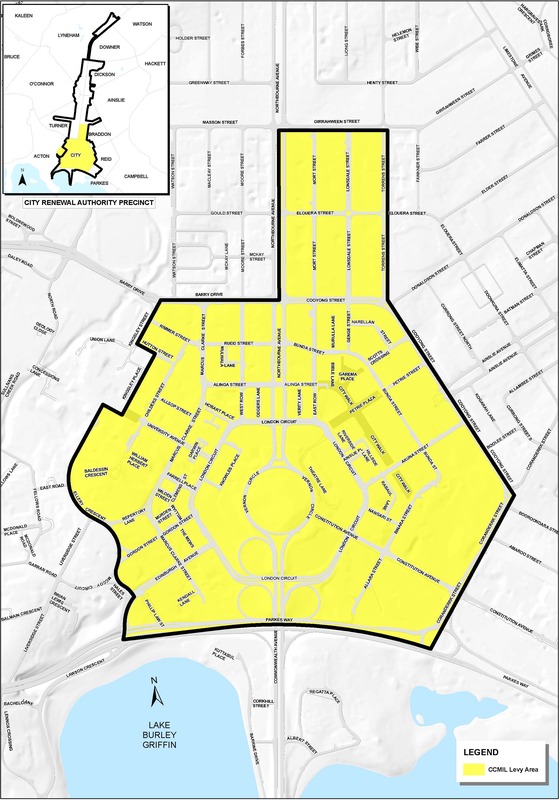 As the City Grants program is funded by the CCMIL, funded projects must occur within the Levy collection zone. City Grants aligns with the City Renewal Authority’s 2025 Strategic Plan and the objectives of the City Centre and Marketing Improvement Levy (CCMIL). Goal 1 - ‘Curation of high-quality places and precinct development, taking a people-focused and design-led approach’. Goal 3 – ‘Application of robust and innovative social and environmental sustainability principles and programs that will underpin precinct-wide renewal’. The Levy objectives were updated in July 2018 to reflect feedback received from key stakeholders. Of the Levy’s five objectives, City Grants most closely aligns to Objectives 1, 2 and 4. Climate-wise design – Healthy, comfortable places for people and nature, adapted to climate change. Social and economic vibrancy - Diverse, thriving neighbourhoods with a public realm to support social connectedness and community health and wellbeing. Sustainable use of resources - Highly efficient use of natural resources, capturing and reusing surpluses. Active travel - Healthy, low-impact active travel infrastructure that enhances walking and cycling experiences and uptake. For more details on the Authority’s position on sustainability and opportunities for City Grants applicants to incorporate sustainable practices into their project refer to ‘6.3. Contributing to a sustainable city’. City Grants is aligned with the City Renewal Authority’s broader ‘City Place Activation Program’. Through this Program the City Renewal Authority delivers City Place Management Services and a seasonal program of events. City Grants provides our community with an opportunity to contribute to this broader program to develop and support the vitality of Civic, Braddon and Acton. A coordinated cleaning, horticultural and maintenance program to improve the presentation of public places in the levy area. A program of day-to-day place interventions welcoming visitors and inviting them to stay longer, e.g. additional seating, planter boxes, shade umbrellas, bump-in and bump-out of beanbags and deck chairs, entertainment programs. Oversight of the seasonal events calendar and support through bump-in and bump-out, cleaning and maintenance. The day-to-day interventions and programs are testing improvements to public places and how they are experienced by users. The feedback is informing the City Renewal Authority’s ongoing program of public realm design improvements and public place upgrades. Braddon is an exciting, eclectic, rapidly changing suburb and the Braddon Place Plan sets out short, medium and long-term actions that seek to guide the development of Braddon’s urban areas. The actions set out in the Plan are underpinned by four themes of Braddon’s identity that were identified following extensive community consultation. They are proudly urban; strategically gritty, next nature, and people-powered. City Grants funding can support projects that contribute to the actions of this Plan. The Braddon Place Plan is available on the City Renewal Authority website at https://www.act.gov.au/cityrenewal/documents. The City Renewal Authority is committed to creating sustainable places that demonstrate both environmental and social sustainability. This includes improving walkability and cycling infrastructure, greenspace and connecting people with nature, using resources wisely (for example water, energy and creating less waste), creating places and activities that help people to connect with others and improve people’s health and well-being. The City Renewal Authority encourages projects to identify and address their impact on the environment – this could be by avoiding single use plastic, selecting materials that can be reused or have recycled content, using water and energy efficient appliances and technology, supporting people to walk, ride and take public transport as a first choice, supporting the development of climate friendly and biodiverse places. The City Renewal Authority’s Sustainability Strategy is available on the City Renewal Authority website at https://www.act.gov.au/cityrenewal/documents. For practical advice on how to reduce save energy and water, reduce waste and cut greenhouse gas emissions, refer to the Actsmart website at https://www.actsmart.act.gov.au/. The website provides details of the range of ACT Government programs and assistance that is available, including the free Public Event Recycling Program. Tier 1 grants provide up to $10,000 to support a project. The application process for Tier 1 grants is streamlined with less eligibility requirements for applicants and a shorter application form. Tier 2 grants provide between $10,001 and $50,000 to support projects that will have a significant impact on Civic, Braddon and/or Acton. The application process for Tier 2 grants requires a higher level of detail, including evidence of a robust planned approach. Funding may contribute to any costs, excluding those listed at 2.3, that support the activity. City Grants funding is open to applications from individuals, groups and organisations. Groups, unincorporated associations, and other bodies with no legal status must nominate an individual member of the group to take legal and financial responsibility for any funding. Be Australian citizens, have permanent resident status in Australia, or, if not a permanent resident, be on a temporary Australian VISA which expires no less than two years from the date of the application. Have an Australian Business Number (ABN), or complete the Australian Tax Office’s ‘Statement by a supplier’ form. Have current Public Liability Insurance coverage to a minimum level of $10,000,000. Have satisfactorily acquitted all previous grants provided by the City Renewal Authority and any other ACT Government agency (except for current year’s funding). Be registered for Goods and Services Tax (GST) if applicable. If the applicant is unable to satisfy the Applicant Eligibility Criteria they will need to be auspiced by an entity that does satisfy the criteria. Providing the grant recipient with an itemised financial statement at the end of the project which clearly identifies how the grant was expended. Completing the acquittal process as per item ‘4.5. Acquittal of Funding’. Applications for both Tier 1 and Tier 2 grants are made through the online grants portal at https://actgovt.smartygrants.com.au/. If, for accessibility reasons, you are unable to apply online, please contact the City Renewal Authority for assistance. Applications must be received by the due time and date, as outlined on the online portal. Late applications will not be accepted. Before starting any project, your organisation and event must meet all planning, health, environmental, legal and insurance requirements under Australian and Territory laws. It is strongly recommended that all applicants contact the Events and Business Coordination team within Access Canberra (eventapprovals@act.gov.au) for advice on regulatory approvals prior to submitting an application through City Grants. Applicants should provide a minimum of one (preferably two) quotes for significant expenditure items (as a guide, for items costing more than $500). Projects that have previously received funding through City Grants are eligible to apply again. However each round all applications are assessed on relative merit and therefore funding should not be considered automatic or anticipated. Repeat applicants should acknowledge funding previously received through City Grants and demonstrate how this new application for funding will address the assessment criteria (refer to 8.5.2. ), in particular ‘Need’ and ‘Benefits’. For the purposes of the City Grants, commercial projects are defined as projects that are expected to return a profit for the applicant. If a project is commercial the applicant must demonstrate a return on investment financially for the City Renewal Authority and/or economically for the surrounding businesses. The project must occur within the eligible project period (refer to 2. Key Details). The project must occur within the CCMIL area. The application must include a sufficiently detailed budget. The application must demonstrate adequate understanding of the required permissions and approvals for their project. The application must provide sufficient information to make an informed assessment. The applicant has acquitted previous funding through the City Grants or other ACT Government entities to a high standard. Applications that meet all the eligibility and general feasibility requirements will be assessed against the following criteria in meeting the primary objective and outcomes of City Grants. How will the project complement and/or add to the City Place Activation Program (refer to 5.2.1.)? If located in Braddon, will the project achieve or complement an action from the Braddon Place Plan (refer to 5.2.2.)? How is the project important to the place in Civic, Braddon or Acton that it will be delivered? meet the primary objective of the program (refer to 1.2.)? contribute to the outcomes of the program (refer to 1.3.)? demonstrate a sound investment and leverage City Grant funding for maximum benefit? How will the project deliver a return on investment financially for the City Renewal Authority and/or economically for the surrounding businesses? Can the project be delivered on time and within budget? their capability to deliver the project? an understanding of and ability to obtain any permissions or approvals required to deliver the project? All applications will be processed by the City Renewal Authority for applicant eligibility, project eligibility, and general feasibility. Following this, separate assessment processes apply for Tier 1 and Tier 2 applications. All applications will be processed by the City Renewal Authority for applicant eligibility (refer to 3.1. Applicant Eligibility), and project eligibility and general feasibility (refer to 3.7.1 Project Eligibility and General Feasibility). Applications are assessed against the City Grants assessment criteria by the City Renewal Authority. Panel meetings will be facilitated by the City Renewal Authority. City Renewal Authority staff will then prepare a brief seeking CEO approval of recommended applications for funding. The City Renewal Authority will contact applicants to advise whether their application was successful or unsuccessful. The amount of funding allocated to fund Tier 1 and Tier 2 grants is determined by the City Renewal Authority based on the amount and quality of applications received. Successful applicants will receive a letter from the City Renewal Authority with a Deed of Grant attached and instructions for the payment process. Payments can take up to 30 days to process following the execution of the deed and upon receipt of an invoice. Tier 1 grants will be paid in one instalment following the execution of the Deed of Grant (unless otherwise stipulated in the Deed of Grant). 75 per cent of the grant will be paid once the Deed of Grant has been executed. 25 per cent of the grant will be paid once the acquittal has been accepted by the City Renewal Authority. GST is payable to applicants that receive funding through this program if they are GST registered with the Australian Tax Office (ATO) and can provide an Australian Business Number (ABN). For successful applicants that are registered for GST the City Renewal Authority will increase the funding amount by 10% after receipt of a tax Invoice. Successful applicants that are not registered for GST will not have their funding increased by 10%. All successful applicants, their proposed activity and the funded amount will be published on the City Renewal Authority website. The declaration on the application form certifies all information provided in the application is true and correct. Action may be taken for repayment of any funding made where information contained in the application is subsequently found to be false or the funding is not used for its approved purpose. on reasonable notice, invite the City Renewal Authority to participate in any public event, media release or media coverage related to the funded activity. A project evaluation report which must include attendance data and photos, which can be used by the City Renewal Authority. No further financial assistance will be provided to any applicant until all grants provided by the City Renewal Authority, and any other ACT Government agency, (except for current year’s funding) have been successfully acquitted. For information about using the City Renewal Authority brand and promoting your project, including the ‘Good Grants Toolkit’ which has four tools: a communication content template; tone of voice guide; design guide; and promotional ideas. For details regarding permissions and approvals e.g. for land use and licensing. A map tool that assists people to access ACT Government location information. For details of ACT Government programs and assistance that will help save energy and water, reduce waste and cut greenhouse gas emissions, including details of the free Public Event Recycling Program. For information about the Arts in the ACT including available support for artists, facilities, policies and upcoming events and activities. For information regarding environment and sustainability strategies and policies and the Actsmart program. For information about event support provided through Events ACT as well as upcoming events in the ACT. A non for profit organisation providing information and resources assisting people to “create and sustain public spaces that build strong communities”. For information regarding land applications and approvals, road closures etc. For tourist-focused information about Canberra, including current and upcoming activities across the ACT.